Mating can occur at any time, but happens to be usually between November and April. The Bengal tiger females can have cubs at the age of 3-4 years; Bengal tiger males reach maturity in about 4 years. After the gestation period of 103 days, 2-5 cubs are born. Newborn babies weigh about 1 kg (2.2 lb) and are blind and helpless. 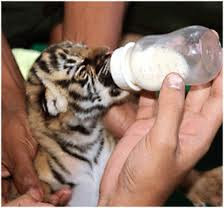 The mother feeds them milk for 6-8 weeks and then the cubs are introduced to meat. The cubs depend on the mother for 1.5 years and then they start hunting on their own.